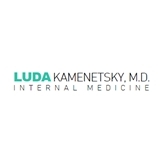 Luda Kamenetsky MD Internal Medicine (Houston) - Book Appointment Online! As a patient's primary doctor, Dr. Kamenetsky monitors a patient's health, diagnoses and treats most health problems and may refer a patient to a specialist if necessary. Her goal is to help you achieve good health through proper diet and lifestyle choices, and well-informed medication and treatment choices. Preventative medicine and wellness programs are important parts of her practice.